We are pleased to share the profile of Dr. Vivek Raghavan, Chief Technology Officer, Team Indus, who has kindly consented to grace the occasion as the Chief Guest of the Annual Gold Award Ceremony to be held on 20th July 2017 at India International Center and felicitate Gold Awardees at the function. Dr. Vivek Raghavan is at heart an out-of-the-box problem solver. He serves as Chief Technology Officer and Board Member for Team Indus, India's entry to the Google Lunar X-Prize, which aims to land a spacecraft on the surface of the moon. Vivek is also the Chief Product Manager and Biometric Architect at the Unique Identification Authority of India. He has been involved in the design, implementation and scale out of the technology platform for Aadhaar, the world’s largest identity program. He joined the Aadhaar project just before the first Aadhaar was issued, and was there when the billionth Aadhaar was generated. Vivek is a full time volunteer, and is in the unique position of playing both these roles in a volunteer capacity. 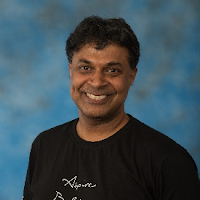 Vivek spent 20 years in the field of Electronic Design Automation, successfully founding, running and selling two EDA startups and being responsible for the design and development of multiple market leading EDA products. He has held senior management positions at Magma Design Automation, Synopsys and Avant! Corporation. Vivek has an M.S. and Ph.D. in Electrical and Computer Engineering from Carnegie Mellon University and a B. Tech. from IIT Delhi.